This powerfully portable lithium battery is the perfect sidekick for the entire Certa PowerPlus range, so you can power on, and on, and on. Compatible across the Certa PowerPlus range. 3x More powerful than the Certa PowerPlus 18V Lithium Battery, the Certa PowerPlus 18V 4.0Ah Lithium Battery lets you work longer and switch easily been the versatile collection of Certa PowerPlus tools. Without any messy cords connecting you to a power source, you can move freely around your workspace, while the built-in LED indicator alerts you to your battery status so you can top up your charge when necessary. 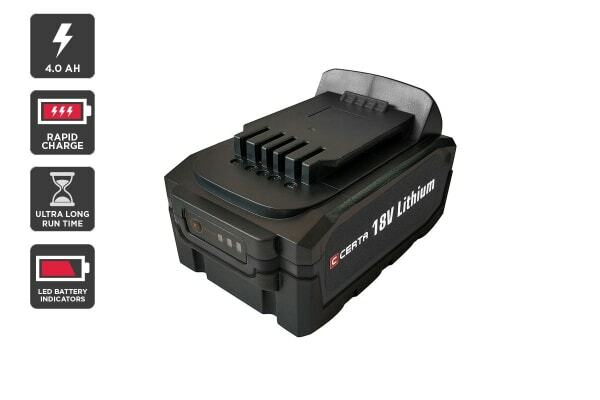 Charge your battery in only one hour with the Certa PowerPlus 18V Rapid Charger.